1. What happened to me as I read? I really enjoyed this book, but not because I immediately related to the characters’ experiences. I think what I liked best about it was that it was so different from my own experiences as a teen, and yet the emotions and attitudes Steve York expresses were so familiar. It is very comforting to read about characters whose stories or personalities echo your own. But there is something extraordinarily powerful about discovering connections with characters’ that appear at first to be very different from you. As I read the book, I became increasingly immersed in Steve’s story. I felt emotionally connected to the characters. They came to life. I cared about them and their relationships, and what would happen to them as a result of the choices they made. When I reached the climax of Steve’s story, I had become so absorbed in the book that I reacted as if the characters and events were actually real. 2. Which features of the book caused my responses? What first attracted to me to Rats Saw God was its appearance. The bold red and black cover caught my attention and seemed to suggest a powerful, energetic story. The book almost seemed to hum beside the other sleepy titles on the shelf; its appearance suggested that there was nothing dull or dreary about it. (As it turns out, I’m lucky to have this particular cover. I found other copies on the internet with much less appealing covers.) The fact that the title of the book made no sense to me encouraged me to pick the book up and turn it over to read the back, seeking an explanation. I really loved the tagline beneath the title: “Everything doesn’t have to make sense.” Following the strange title, it’s a pretty witty statement, and having read the back of the book and therefore knowing a bit about the plot, it seemed like a rather sharp observation. It suggests that the book offers a daringly honest, frank perspective on being a teen and on life in general. We’re always trying to make sense of things, find meaning…and we’re often frustrated by our inability to do so. The events of Rats Saw God take place in the mid-90’s. At one point in the novel, the characters react to the news of Kurt Cobain’s death. I remember exactly where I was when I heard that news. We’ve talked about how including events from popular culture can negatively impact a novel, fixing it in time so that future readers are unable to relate. I don’t think that this novel suffers from being situated in a specific moment, but I’m not sure if this is because I experienced that moment myself. I don’t think so. Rob Thomas doesn’t insert pop culture references into the novel in a weak effort to convince readers that it’s “hip”. The story is established in a particular time period in much the same way that it is set in Texas and California. These features aren’t carelessly inserted simply to up the “cool” factor. They are integral parts of the narrative, and they help shape the entire tone of the novel. I loved the narrative style of the novel. I really enjoyed how we were able to hear Steve York’s private thoughts, as well as read the essay he wrote for his guidance counsellor. It gives the reader the opportunity to get to know Steve from two perspectives. The slight differences between the two are very well done. I also really enjoyed the story. I was fascinated by the Steve’s eccentric group of friends. The characters were well developed, unique and vividly brought to life. I especially loved the subplot involving Steve’s sister and her boyfriend. Thomas manages to balance the two storylines. He gives weight to Sarah York’s character and her relationship with her boyfriend and her family, without taking away from the power of Steve’s account of his life in Texas with his dad and his relationship with Dub. 3. What does this book ask of readers if they are to enjoy what it offers? 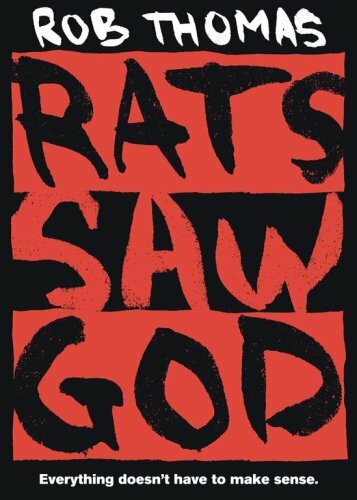 Rats Saw God asks that readers be willing to contemplate the events and relationships in the novel and figure out for themselves what these experiences mean to Steve York, to his sister Sarah, to Dub, to Steve’s parents, and to the rest of characters. In some of the other novels we’ve read, the moral of the story (or the “point”) is made fairly obvious; readers don’t have to work too hard at figuring out what the book is all about. In Rats Saw God, the answers aren’t handed out to readers. In fact, there may not be any answers at all. The book leaves us a lot to think about. 4. Why is this book worth my own and teenagers’ time and attention? Rats Saw God gives readers the opportunity to think about the incredible, confusing, frustrating complexity of relationships. Not just love relationships, but also those between friends, siblings, parents and children, teachers and students, etc. The characters’ interactions are realistic in the sense that they are anything but simple. Each person’s unique personality comes into play. Although we are mostly confined to Steve’s viewpoint, we have glimpses of other characters’ perspectives through their actions and responses. By the end of the book, Steve recognizes that his observations and his experiences were only one out of many ways of viewing the unfolding events. Rob Thomas shows us how limited a single person’s perspective can be, and how this limitation affects our relationships with the people around us. The book invites readers to do some self-reflecting of their own, an activity every person can benefit from. 5. Which would be the most appropriate way of introducing this book to the young people I have in mind? I don’t think it would be difficult to catch readers’ interest with this book. It would be fairly easy to make a book talk for the novel. The blurb on the back of the book is a bit weak, I think. It doesn’t convey the depth of the topics covered by the story. It might be useful to think about novels or movies that have similar themes and use them to help describe the book. There are a lot of references to music and art in the novel. If I were setting up a display in the library, I would try to incorporate some of those bands and artists into the presentation. 6. What do I know of the background of this book – about its author, how it came to be written, or the place where it is set, and so on – that might interest the YA reader and stimulate their desire to read? In addition to writing novels, Rob Thomas is also a screenwriter and producer for television and movies. He created the T.V. show Veronica Mars. He was also a writer for Dawson’s Creek and the new 90210. Rats Saw God was Thomas’ first novel. It is set in Texas and California, both places in which Thomas has lived. It takes place in the mid-90’s, and the music and culture of the time period play interesting roles in setting the tone and establishing the personalities of the characters in the novel. 7. Are there books by the same author, or by other authors, which relate to this one and which the YA readers have already read, or perhaps ought to read before reading this one? And are there books that follow on from this one? Rob Thomas has written five other books, including Slave Day and Doing Time. None of his books form a series, and there are no repeating characters or correlations. His other books have been received very well by critics and they sound equally engaging. Slave Day is about the common practise in American high-schools of auctioning off teachers and students to the highest bidder for one day to serve as their “slave”. It uses alternating first-person narratives, including a geek, a popular girl, a football player, and even a teacher. Thomas’ novels tackle complex issues, usually relating to the challenges of relationships, with a clever mix of humour and gravity. Reviews of Rob Thomas’s novels by critics and by readers highlight both their entertainment value and their ability to stimulate thoughtful reflection.